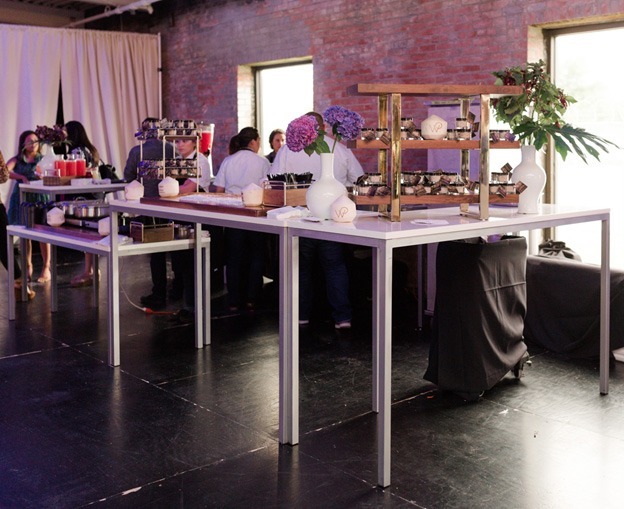 From the ILEA Open House in August, Wolfgang Puck Catering literally elevated the catering experience by using AFR’s Aspen Bar Tables which are taller than standard buffet tables. Is social media changing our event design, or is it vice versa? Either way, the movement towards creating an Instagrammable moment has made design more exciting than ever. 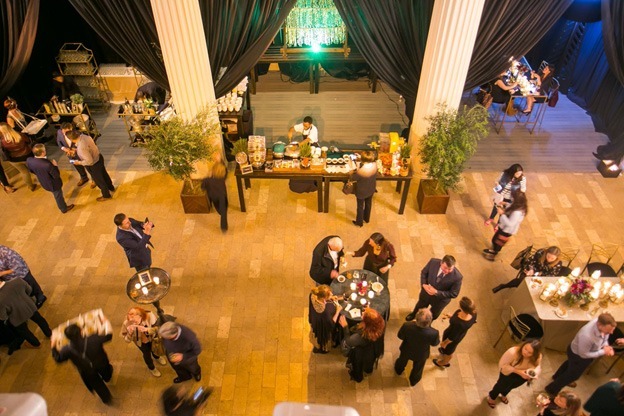 And one of the most shareable elements of an event is beautiful cuisine and signature cocktails. But it’s not just that alone. How do we get guests to reach for their smart phones? Creativity and pre-planning! “The key to great design is to see all the foundation items (i.e. bars and tables) as part of the experience, rather than an afterthought,” says Houston-based AFR Account Executive Sydney Archer. To better integrate design into the guest experience, she has begun to work closely with the city’s top caterers earlier in the planning stages of their events. In addition, Archer has found that when caterers don’t have to rely only on what the venue has in stock, they also bring in unique harvest, grazing, or illuminated tables that tie into and enhance the bar design. Here are three ways she has seen this done successfully. For the official launch party of Wolfgang Puck Catering’s off-premise division in Houston, Archer and Chelsea Monroe, WPC’s Catering Sales Manager, came together early to lay the design foundation for a Speakeasy theme at the Corinthian, a Deco-style bank turned venue. For this food-centric event, selecting the right buffets and bars was essential. Photo credit – Carter Rose – Wolfgang Puck Catering. “The event was food-focused,” Monroe says. 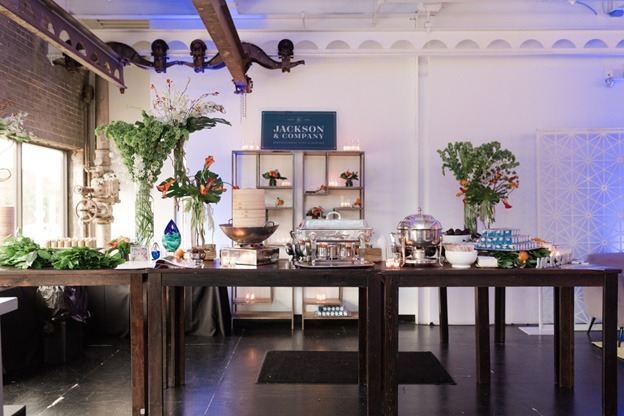 “When guests walked into the event space from the second floor, we wanted them to see the food first. We wanted to show our hand-crafted hospitality and innovative cuisine.” And AFR’s furnishings were perfect for the look and tone of this. To scale back the cavernous space (it holds 500 but the event was for 200), Monroe worked with Johanna Terry Events to create alcoves. Each one featured something different – a lounge featuring all AFR furnishings, a food station, bar carts with bar back shelving from AFR, and one space just for a vintage typewriter that implored guests to “leave us a love note” – which they did. The buffet for the interactive art salad station was an all-white buffet table that showed off the colors of the food art created by the chef. 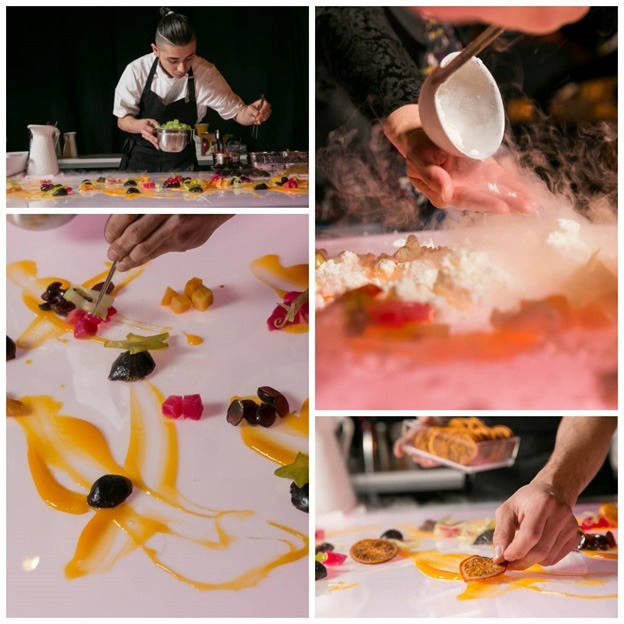 Guests got a highball glass pre-filled with winter greens and then finished off their salads by choosing the toppings and dressings on the table such as pressed beets, passion fruit gelée, dehydrated citrus, figs, and nitrogen goat curd. From beginning to end, the message was clear – Wolfgang Puck Catering is ready to create delicious memories one unique action station and signature drink at a time! Think differently about buffets. This interactive salad station delighted guests with beautiful colors and surprising ingredients. Photo credit – Carter Rose – Wolfgang Puck Catering. 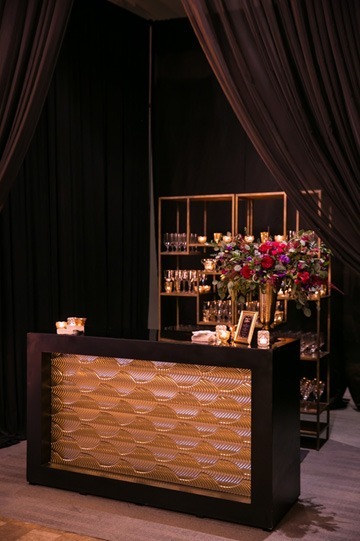 AFR’s Noir Bar in Gatsby Gold elevates the design at any venue. The gold textured panel looked as if it belonged in the Deco environment of the Corinthian. Photo credit – Carter Rose – Wolfgang Puck Catering. Look for the nearest exit? Make a beeline to it so you are first in line for the gourmet flavors of the nitrogen ice cream from The Freezing Point? Our four-foot LED bar is the table of choice by The Freezing Point with its small footprint and custom vinyl branding. Answer three of course! With so much competition for attention on a trade show floor (or at an event), vendors hire Carolyn Gaidos and her company, The Freezing Point, to drive traffic to their booth. When Gaidos is involved there will be something sweet and cold, a branded message, and of course, an Instagrammable moment that keeps people in the booth. Gaidos has learned that AFR’s four-foot LED bars are the biggest WOW for the smallest footprint. “In a 10’ x 10’ booth, there isn’t much more room for anything else. AFR doesn’t charge us a fee if we are creating and installing the graphic ourselves, we elevate the design and the attention the booth will get,” she says. AFR can print a custom graphic and do the installation for an additional fee. Being in business for three decades often leads a company to sit back on its laurels. But Jackson & Company isn’t sitting back on laurels or any other fresh herb. The catering firm continues to look forward to trends that will set them apart and they works with Archer at AFR to do so. When chefs want to see eye-to-eye with guests, consider using buffets that are a little higher than normal. For a recent event, Archer suggested rustic grazing tables that are higher than normal. “This enabled our chefs to stand at the tables and interact with clients directly across the table,” Stobb says. “We love that AFR and Sydney are so proactive and help us stay current,” Stobb continues. Staying current, creating shareable moments, using bars and buffets in new ways…it’s all part of how Archer and her colleagues at AFR continue to help clients elevate the experience for guests. Because, at the end of the day, although memories might live forever on social media, they all must be created and experienced first at a well-thought-out and creative event!